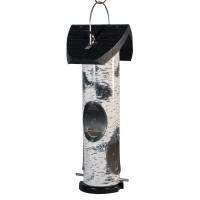 With innovative designs and rugged construction, bird feeders from Vari-Crafts are in a category all to themselves. Based in the United States, Vari-Crafts always puts a focus on creating quality products made from the finest materials. If squirrels are a problem, there's nothing to fear. Not only are Vari-Craft products extremely durable, but they also come with a lifetime warranty against squirrel damage. On top of the lifetime warranty from Vari-Crafts, when you buy from Backyard Chirper, you also get our 30-day, money-back guarantee. This is a great wire cage feeder. Holds a ton of food and the squirrels can't touch it. Great value too. This note is suppose to be for the suet cake feeder & the other review I wrote was for this feeder . 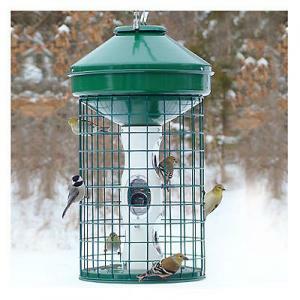 The suet cake feeder with built around cake is ideal. No more wasted suet cakes on starlings. They can go back to the farmers fields. Beautifully made feeder. Have successfully eliminated unwanted Grackles and attract many varieties of smaller songbirds with Fruit & Nut Seed. I am so happy I purchased this feeder. We have bears that come and invade our feeders and this one is bear proof. 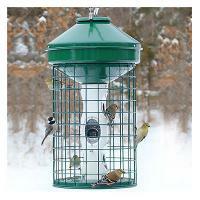 It is basically indestructible.The construction of this feeder is high quality. I definitely recommend this feeder. Squirrels can hang down and get seed from it but they don't stay long... to much work for them I suppose. The feeder operates as expected. Small birds enter, feed, and fly away. Seed capacity is ample for several days.